There was a real good article in the N&O this weekend about homeowners getting more out of their homes in a down economy with a backyard deck. I did that on a much smaller scale about 6 years ago and have never regretted it. The long term maintenance for me has been minimal and can be for you depending on your perspective. The railing lasted four years, but the flooring lasted a little over one with two coats. The second time I restained the floor (18 months later) I did two coats, the third time I restained the deck completely (four years from original) I applied two coats to the then dried out railing, and FIVE coats to the flooring. It's not as bad as it sounds because you can re-coat in 2 hours or less. 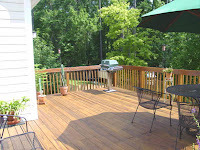 It's a weekend project for DIYers, but the enjoyment you'll get from the new outdoor room far out ways the expense. 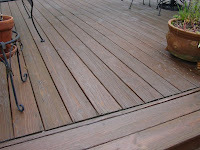 During this unusually cold and snowy Winter of 2010 my current 18 month old restaining still makes my 13 year old deck look awesome, but I may add a couple more coats to the floor as insurance this Spring just to keep it that way. Let me know when you want one. My real estate home seller and buyer programs offer home enhancement programs that include custom interior painting, exterior pressure washing, deck staining, and landscaping. Home seller programs start at $995 complete with a Triangle MLS listing, yard sign and fliers.